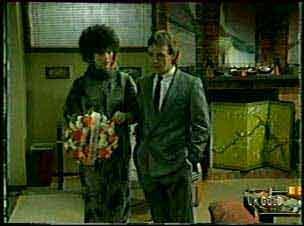 Paul and Terry exchange marriage vows. A woman with a dog talks to a shifty-looking man in the car. They talk about how the bomb scare obviously wasn't enough to stop the wedding. 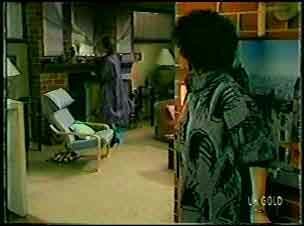 They head off to Des's house to look for a tape while Terry is out. The dodgy-looking man and the woman (not sure what she did with the dog) come in through the unlocked front door and start to search the house. The wedding reception is continuing. Shane invites Des to dinner with him and Daphne, but he says he's feeling a bit down and would rather be on his own. They chat about Max and Shane tells Des that they are both moving back to Ramsay Street tonight. Shane says he's looking forward to go out raging with Daphne. Des thinks he should ask Daphne first. Shane bets Des $20 that Daphne will come out with him. Lucy overhears. 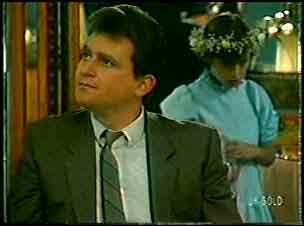 DES: Daphne doesn't deserve this, mate. Daphne is trying to help Scott to fix his camera but it's broken. She offers to lend him hers as a stop-gap measure. The dodgy woman has found the wreath in the dustbin. She says it's a shame to waste it(!) They have had no luck finding the tape. Just then, they hear Daphne coming, so they both hide. When Daphne comes in, she finds the wreath on the floor, and is puzzled, but brushes it off. As it happens the man knows Daphne from her stripping days. They continue to search the house. Lucy tells Daphne about Shane and Des's bet and Daphne is shocked. LUCY: It's worth a lot of money. DAPHNE: Is that what I'm worth to him? LUCY: Yeah, Four weeks' pocket money! Danny comes in and finds Maria in the kitchen. He starts to cry and tells Maria that he's going to miss her so much. They hug and Maria tells him she'll miss him too. Maria says she's been there through all Danny's milestones and she'll won't be there for the moment he turns into a man. Danny begs her not to go, but Maria says she has to. She says their love is suffocating them, and they have to let each other go. (Er...what?!) Danny says he'll change if she gives him another chance. DANNY: I need you! I'm scared! 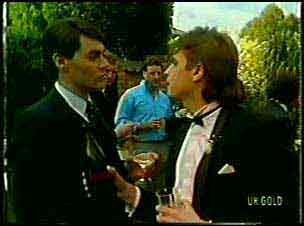 A bloke called Mark has turned up - apparently he is a friend of Paul's. 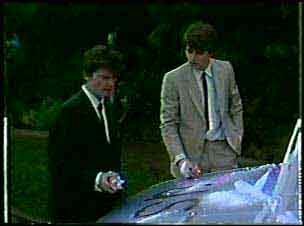 Paul introduces him to Daphne. Just then Shane comes up and Daphne starts flirting with Mark. Daphne explains to Mark quietly about the bet and how she's angry with Shane. Scott and Danny are decorating the car. Danny looks gutted. Scott says Danny could have gone with Maria, but Danny says there's nothing for him in Hong Kong, his life is in Australia. Just then, Scott notices a curtain move in Des's place. 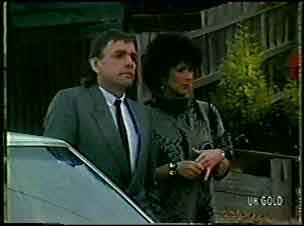 He and Danny head off to tell Des. Scott and Danny have told Des. He goes off to find out if it's burgulars. Scott and Danny decide to give him backup, just in case. 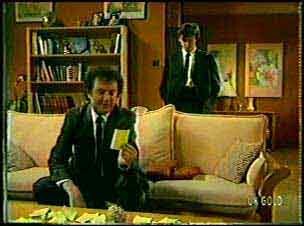 Des comes in and finds his house has been turned upside down. Daphne and Jim survey the wreckage with Des. He doesn't want to call the police though as it would spoil Terry's day. When Jim has gone, Des and Daphne survey the wreath. Daphne realises that whoever it was must have been in there when she came back to get her camera. Des hugs her sympathetically. Maria is takes some pictures of Max, Shane and Danny out of the family album. She holds them to her heart, then picks up the phone. She calls a taxi to pick her up to go to the airport. Then she holds the photos to her heart again and silently surveys the living room. Des and Daphne comes in with Terry's stuff (so that she doesn't have to see the wrecked house). Shane comes up to Daphne and tells her to stop trying to make him jealous with Mark. Shane admits he was wrong about them, and invites her out to dinner tonight. DAPHNE: I'm terribly sorry Shane, can't make dinner tonight. Danny and Max are cattying some of Max's things up the street. As they do, they see Maria getting into a taxi. Danny goes to approach, but Max tells him to let Maria be. MAX: If you love her, let her go. The taxi passes but Maria doesn't see them. The taxi pulls out of Ramsay Street as Max and Danny look on. Daphne and Lucy are conspiring again while Shane warns Mark off Daphne. Mark says it's none of Shane's business! Daphne tells Jim about the wreath that Terry was sent this morning, but that the police doesn't want to know. Now, with the burgulary as well, she thinks someone is doing a hate campaign. Paul and Terry are just leaving and everyone is seeing them off. Everyone throws a ton of confetti and Danny and Scott have done a great job on the car. Terry throws her bouquet and Julie catches it. 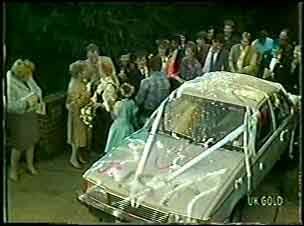 As Paul and Terry get into the car, Max watches sadly from the Ramsay balcony. Shane looks a bit sad too. Max comes into the house looking very dejected. He sits down on the couch, then Danny comes in. Max rants that Maria has left a load of instructions for them on post-it notes. DANNY: It's good to have you back, Dad. Danny and Max agree they'll give things their best shot without Maria. Shane is very angry that Daphne is flirting with Mark. He's clearly a bit drunk and proves it by going to hit Mark. 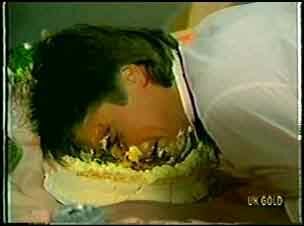 Unfortunately, Shane loses his balance and end up face-down in a cake!